I just joined the Bike Fed! No, I didn’t just become a member. I’ve been a member for 15 years. I am excited to announce that effective July 5th, I will be the new Director of Communications for the Bicycle Federation of Wisconsin. Obviously that means I am leaving my position as the Bicycle and Pedestrian Coordinator for the City of Milwaukee. 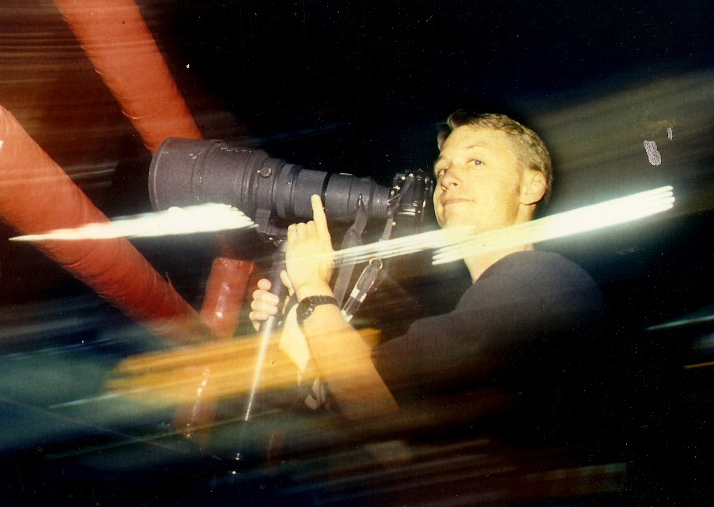 Me shooting the Brewers for the Associated Press when I was still young and good looking. My new position will bring my career in cycling full circle. I have a journalism degree and worked my first decade out of college as an editorial photographer shooting for magazines, newspapers and wire services like Time, Newsweek, The Milwaukee Journal and the Associated Press. I was bitten by the bicycle bug in the early　nineties, and my cycling fever grew until I finally gave in to my obsession in 2001 when I was hired as the first Milwaukee Program Manager for the Bicycle Federation of Wisconsin. I enjoyed that work until 2005 when the exciting tales of working in bureaucracy tempted me away from the high pay of non-profits, and I went to work for the Department of Public Works as Milwaukee’s first Bicycle and Pedestrian Coordinator. StreetShare Pedestrian Safety Week was an initiative I developed with the help of the Mayor's Bicycle and Pedestrian Task Force. 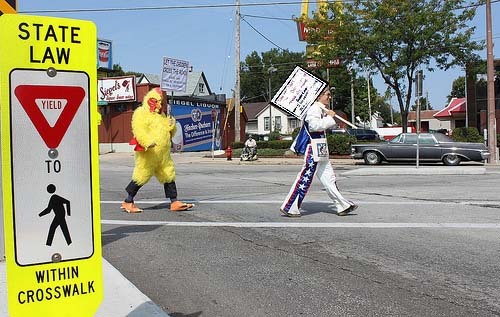 The Chicken suit and other costumes were all me though. In the six years that I have filled that position for the City of Milwaukee, I divided my time between bicycle, pedestrian and traffic calming issues. As much as I care about all those things, cycling is my true passion. This new opportunity at the Bike Fed will allow me to be all bike all the time. My job in DPW has been both challenging and rewarding. Milwaukee is my home town, and I care deeply about it. 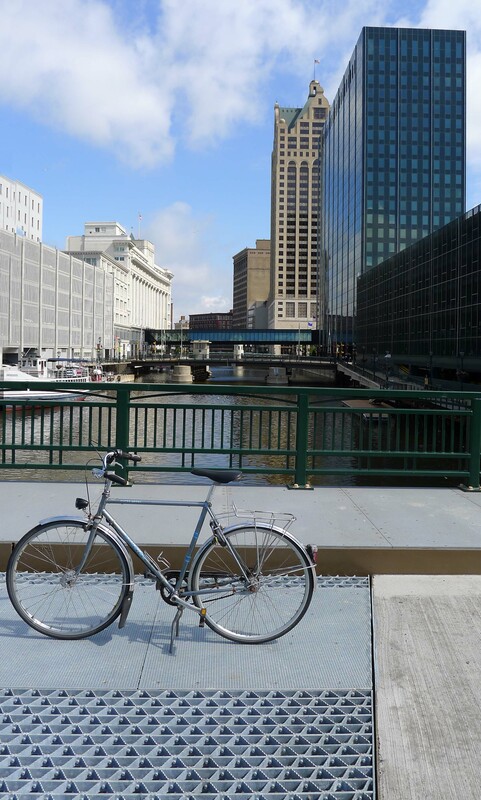 In my work as a public servant, I tried to combine a passion for cycling with my love for Milwaukee. I think that I can look back on my accomplishments with some satisfaction. The anti-slip bike plates on our lift bridges was my idea, but the design was all done by the great problem-solving engineers in DPW's sturctural department. The degree to which I was successful at helping Milwaukee become a safer, more pleasant and more convenient place to bike, walk and live is due in large part to the support I got from the senior staff at DPW and　from the elected officials across the street from my office. I thank them for their patience with my early inexperience as well as their continued willingness to listen to all my crazy ideas. I would not have been able to get one mile of bike lane proposed in the bike plan painted nor a single speed hump constructed under the neighborhood traffic management program without the assistance of very knowledgeable engineers and the approval of the Mayor’s office and the members of Common Council. Although I am leaving my City job, I will remain a voice for cycling in Milwaukee. I will be working out of the local Bike Fed office and will continue to be a presence in my home town as a card-carrying member of the Cyclists Union Local 52 and writer of this blog. I hope readers of Over the Bars are as excited as I am that in my new position as director of communications for a growing state-wide organization will I be able to will use my voice to tell the great and varied story that is bicycling in Wisconsin. There are amazing tales to tell about the benefits of biking for transportation in our urban centers of all sizes, from Ashland to Kenosha. Our state boasts world class mountain biking, road racing and recreational trails. The bicycle industry in Wisconsin produces the best bicycles and accessories in the world, from Tour de France winning carbon fiber to the rolling art of hand-brazed steel and on down to simple essentials like best in class blinkie lights. I look forward to sharing the stories of the people and members of the bicycle industries across Wisconsin who love cycling as much as I do. So stay tuned to Over the Bars as it evolves and matures. You may see some changes here as I transition into my new role working with the great team at the Bicycle Federation of Wisconsin, but I promise not to go away. Congrats on the new job! I’m sure you’ll continue to do great things and motivate people in this city to get excited about cycing! Congratulations! You’re going to do great things with the Bike Fed! Very cool! Welcome back to the Bike Fed. Something tells me we’ll be working together more. Congratulations, Dave! Looking forward to hearing about great things from the Bike Fed from all around Wisconsin. Do stay in touch Tim. As I transition Over the Bars in Milwaukee to Over the Bars in Wisconsin, I will be looking for more guest bloggers since I can’t be everywhere all the time. Let me know if you have something you think would be a good cross-post. Congratulations to you and also to the Bike Fed, great catch for them! Also, I look forward to seeing you on the path more often between downtown and the east side. Thanks d’Andre. Hopefully I will get to ride more in general given my new job is all bike all the time. Congratulations, David. A job well-earned. You will do well for us bicyclists. Keep multi-modal in mind and you will always have nonbicyclists who support bicycling. As it stands now, the money is being taken from public transportation, even as bicycling enjoys an upsurge in support and activity. How lucky we bus riders (I bus when I have to) would be to have a full time Communications Coordinator for the bus rider. Instead we have Robin Vos who has brought the state power to crush our most promising, but most fledgling transit institutions. We had to beg to keep the state from sending $46 million back to the feds. We lost $800 million for the bicycle-friendly train, as everyone knows. As I bike past bus stops where on other days I wait, I see the faces of bus riders waiting for their ride. Saying good morning is natural to me, standing so close. And we are close. Riders and bicyclists have issues in common. The bus rider is not just waiting for the bus, they are waiting for politicians who get it. The friendly bicyclist is balm for their frustration. Transportation policy affects everyone. David, I am very happy for your new appointment because of the legacy you are leaving with the City – a tough act to follow. Thanks Bill. Working with any political party is challenging. I remember 10 years ago when the democrats were in the majority and they didn’t understand bicycling either. We now have to make our case to a different party, but cycling in bike-partisan and perhaps even more conservative and libertarian than transit. Good transit and inter-modal connections are certainly elements of any bike-friendly city. The folks at the Bike Fed will certainly remain allies for transit as most of the staff are transit users like yourself. That said, I will be focused on the Bike Fed’s mission statement and adovcacy objectives while at work. Advocacy is what I do at work, activism is what I do at home. Well said, David. Not to put too fine a point on it, but my advocacy and activism is helping all understand that the overuse of fossil fuels is neither conservative nor libertarian. Huge government subsidies to the “independent” driver of an automobile is neither conservative nor libertarian. The very air we breathe is everyone’s stake in the future of transportation – advocacy or activism. All public transportation is nonpartisan. We press on. The local victories transit enjoyed for a moment last year were taken away with the stroke of a pen in Madison. There is an interesting study being conducted at UWM just now that clarifies transportation history in Wisconsin – local control was gamed by the State, 70 years ago, just as it was this year, setting terrible precedents. Bicycling is not safe from these political rigors. Enjoy the plaudits you hear here, you deserve all of them. But stay close to your allies. There is an instructive struggle going on in New York City just now, about the dominance of bicycles. The lesson? Never take your politics for granted. Find allies before you need allies. Congratulations, Dave! I’m happy that Milwaukee and now the rest of Wisconsin will continue to have a tireless advocate for cycling. Congratulations, Dave, and thanks for all the work you’ve done for the city. You’ll be a tremendous asset to the Bike Fed. Congrats. I hope you keep this blog alive. Thanks for all the great info this past year. Congradulations Dave. You leave big shoes to fill. Also the bike collective will be hosting a women’s night on Thursday nights starting next month if you want to start spreading the word. I’m planning on some workshops to help women maintain their bikes and get them biking around the city more.